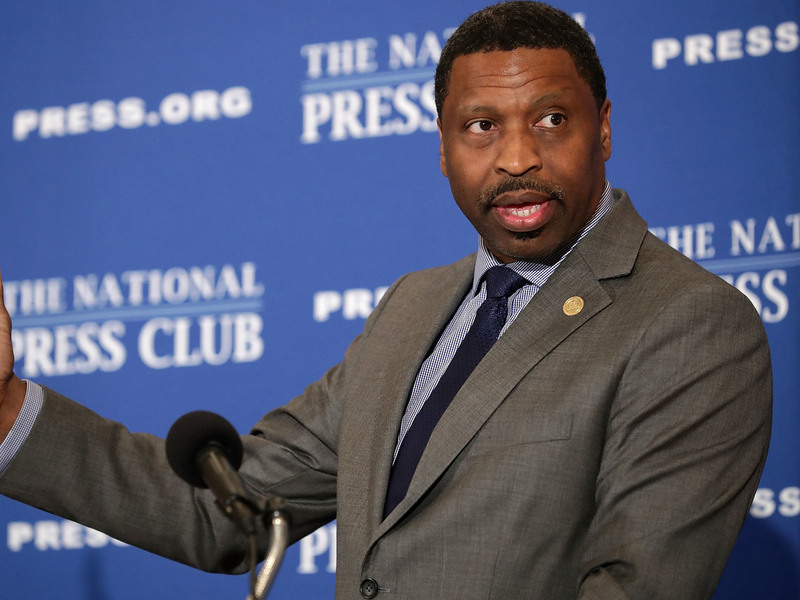 NAACP Elects New President, Will Assume More Political Non-Profit Tax Status : The Two-Way The 108-year-old organization chose Derrick Johnson, who had served as interim president since July. NAACP President Derrick Johnson addresses the Newsmaker Luncheon at the National Press Club August 29, 2017 in Washington, DC. The NAACP — which at 108 years old must balance both its storied legacy as the nation's oldest civil rights group and the potential for irrelevance amid a fresh wave of racial justice groups born of social media such as Black Lives Matter — decided to shake things up a bit on Saturday. The organization announced its new president and CEO and its intention to alter its tax status to a non-profit category that permits more aggressive political lobbying. Forty-nine-year-old Derrick Johnson is familiar not only with the organization but also with the post he was unanimously elected to Saturday for a three-year term. Johnson had served as interim president and CEO since July. In February, he had been elected as vice-chairman of the board of directors. Before that, he served as state president of the Mississippi State Conference of the NAACP. During a phone call with reporters, Johnson also said the NAACP's national office would soon transition from the 501(c)3 non-profit status it currently holds to become a 501(c)4. The change will lift significant restrictions on the NAACP's ability to engage in political lobbying. IRS rules permit political actions by 501(c)4 groups, though not as their "primary activity." Speaking with reporters, Johnson said the decision was in line with one of his organization's top priorities: promoting candidates and issues in local and Congressional elections ahead of next year's midterms. He added that the change would also allow the NAACP to speak to the needs to African-Americans across the country in an increasingly political climate. The NAACP said in a statement that it chose Johnson believing he could help the organization reinvent itself to more vigorously respond to "new threats to communities of color emerging daily and attacks on our democracy." After more than a century in operation, the NAACP continues to face questions about its ability to connect with a new generation of younger, more technologically savvy racial justice advocates. Black Lives Matter leader DeRay Mckesson said he had seen the NAACP's name recognition on the wane during protests in Ferguson, Mo. three years ago. "There was a younger person than me who was, like, just budding 20. And he was like, what is NAACP? And we were, like, shocked," he told NPR's Hansi Lo Wang in July. Johnson told reporters Saturday that, while the organization doesn't disclose its membership count, its rolls have seen growth in the past two years. He has previously conceded, however, that the NAACP needs to draw more young members, specifically those between the ages of 21 and 35. The NAACP made headlines in August when it issued a travel advisory for the state of Missouri, saying visitors should "show extreme caution." The organization had never before done so for a single state. The move was in response to a newly-passed state law that made discrimination lawsuits harder to win, as well as racial incidents at the University of Missouri and statistics indicating black drivers were significantly more likely to get pulled over. Johnson was interim president in August when a white supremacist rally in Charlottesville, Va. turned deadly and provoked an equivocal response from President Trump on the moral standing of protesters marching to defend a Confederate monument. "We shouldn't have a president - we shouldn't have a country that tolerates this type of situation," he told NPR's Morning Edition at the time. "We have lived through this. We should've learned from our history. And there's no reason for us to repeat this history again." Perhaps signaling his willingness to also perform activism over more contemporary mediums, Johnson responded to Trump via Twitter.